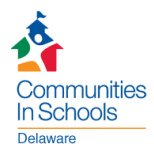 Communities In Schools of Delaware (CISDE), looks to support nearly one thousand students and their families who are currently homeless in Kent County. CISDE received $100,000 a year for the next three years to pilot a homeless student support network. Funding from the Potter Trust Fund through the Cen-Del Foundation will help connect students and their families to services and partners that CISDE is coordinating at the school level. All Kent county schools have access to this service, which is being coordinated with Visiting Teachers at districts across the county. For more information contact Karen Harmon.